Film Fetish Friday is back! Though, in a slightly different format: every first Friday of the month Overdose’s beloved film-critics Anouk and Steven will discuss a film over a nice cup of tea. Showcasing their brilliant sense for dialogue the two critics will – according to FFF’s classic formula – appreciate cinematographic pearls accordingly or slaughter sucky films. Without mercy, of course. Steven: So, you are not too keen –to put it mildly– on seeing this new Spielberg film. Why not? Anouk: I think the 150 minutes will kill me. We already know how it ends: no more slaves, Lincoln dead in a theatre. But fine, you really want to see it. Steven: Yeah, I think it’s great to see Spielberg return to something more compelling than War Horse. And even though we already know how it’s going to end, recent films like No and Zero Dark Thirty showed that a compelling historical cinema can be interesting. The bigger question might be: are you a Spielberg fan? Anouk: I’m not a big fan, no. Although I like Indiana Jones. That’s his right? Steven: Haha, yes that’s his! But really? Jaws, Saving Private Ryan? I mean he made some good stuff in the past! Anouk: Hello-ho! Saving Private Ryan… Tom Hanks! Hate that guy. Steven: Okay granted, but Daniel Day Lewis? I mean, There Will Be Blood! Acting doesn’t get much better than that. Anouk: I can’t help but see a method-acting Daniel Day Lewis every time. And I see him walking around on set, still in his role, while the other people just wanna have a sandwich and chill a bit. So annoying. Steven: Surely though, there has to be something you’re excited about in this film? Anouk: NO! I do this for you. Anouk: This is so boring! Steven: I want to shoot that little kid. Anouk: That kid must die, for sure. Steven: With a nail gun. Anouk: Hope it happens, will make this a bit more fun. Steven: It’s not going to happen, Spielberg wants us to care for Lincoln’s family. Anouk: OMG, will the 13th amendment get enough votes!? Steven: I’m not so sure. Great musical score by John Williams though! Anouk: John Williams, never a violinless moment! Steven: What do you make of misses Lincoln? Want to hug or strangle her? Anouk: Strangle. Oh, sssst… more talking! Anouk: Ok, the 13th amendment is a go! Anouk: This was the most boring film I’ve seen in quite a while. Steven: Right, so I take it you weren’t too impressed by ‘Spielberg the sociopolitical director’ in action? Anouk: That’s no “sense”. That’s just word diarrhea. Steven: Really? I thought Daniel Day Lewis as slow-paced Lincoln gave a couple of nice monologues. Is him winning an Oscar for the part justified here? Anouk: Who were the other nominees? I don’t remember. Probably actors who gained a lot of weight for the part or played an imbecile. Steven: Bradley Cooper for Silver Linings Playbook, Hugh Jackman for Les Misérables, Joaquin Phoenix for The Master and Denzel Washington for Flight. Anouk: Phoenix was awesome! He should steal the Oscar from Lewis. Steven: Phoenix should have won, yes. 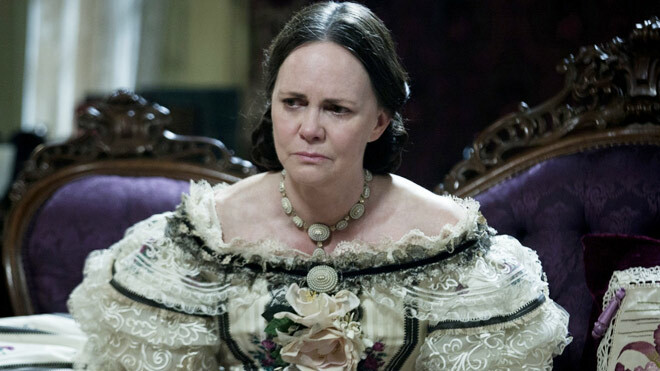 Still, I liked most of the acting in Lincoln. 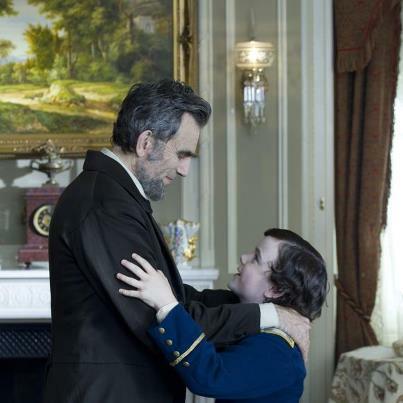 The biggest problem for me with this film is the fact that Spielberg focuses so much on Lincoln’s family. I didn’t feel anything for Lincoln’s wife or sons however. Anouk: And he focuses on talking. Steven: Those father and son moments were horrific. John Williams doing his thing on the violin. It wasn’t convincing in my mind. Anouk: Indeed! And I thought: yeah yeah, I get it: Lincoln was tall. It was like looking at Gandalf sometimes, Lincoln’s wife being a hobbit. Steven: Next time you decide on the movie. For now I have one question left. Steven: A big point of criticism in the US was the fact that Spielberg focused solely on a white perspective in this story, on the final stages of the abolition movement, with the absence of Frederick Douglass being the biggest cry point. Is Spielberg Caucasian-centric in this film? Anouk: Yes, Steven. And a Zionist. No, seriously. Of course Spielberg is. There are almost no black people in this film. Anouk: Where the hell did that come from? Anouk: Why not! This is Spielberg giving the finger to Palestine. Conclusion: Lincoln is in fact Zionist propaganda. Steven: I can’t wait to see his next movie. Jurassic Park IV! Spielberg returning to the entertainer in him, perhaps he should stick to that.